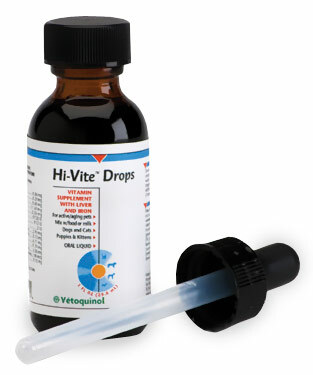 Hi-Vite Drops - 1 oz. This liquid vitamin supplement keeps eyes bright, coats shiny and pets healthy. Hi-Vite Drops has a complete assortment of essential vitamins and minerals like Iron; Riboflavin; Sodium; Chloride; a full range of necessary B vitamins; A, D, K & E vitamins; Niacin & Phosphporous; Copper; and D-Panthenol. Hi-Vite Drops can be mixed with water, food or milk and should be given daily. Give dogs, cats, puppies and kittens 1/2 dropperful twice daily.